Every now and then, a person pops into your life who brings a smile to your face just about every time you see them. They might not be someone you’re particularly close to, but you see them often enough to know their name and to stop to have a quick chat about the state of the world when you see them, instead of just passing them by with a smile and a nod. These people are positive presences in the world — the kind of folks who restore your faith in humanity, and who make this planet a better place to live. 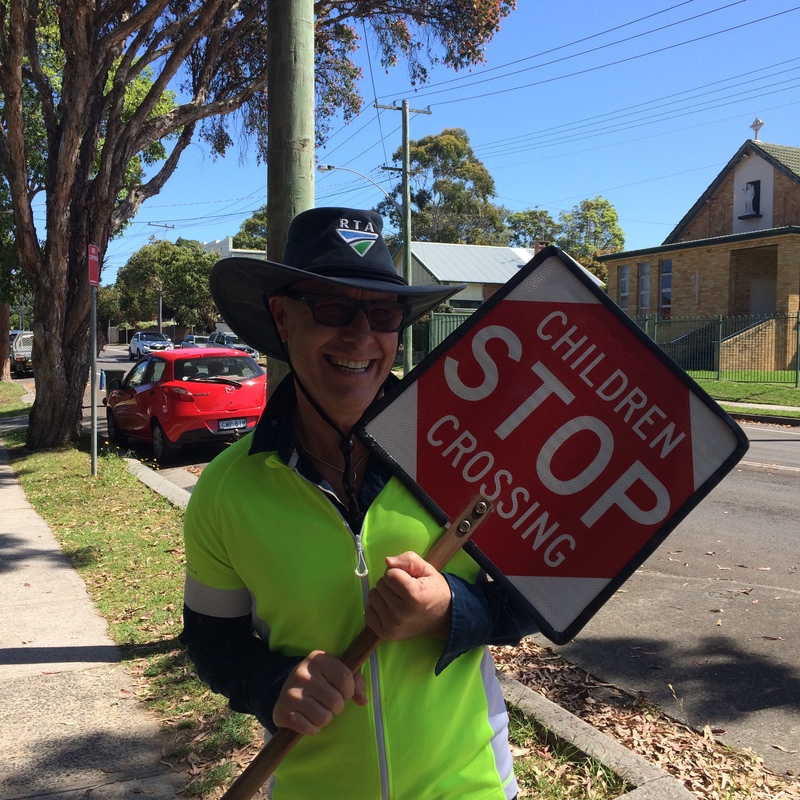 Today, I want to salute a man whose smiling face and cheery welcome brightens our lives — twice a day, Monday through Friday: our favourite Lollipop Man, Drew Pengilly. For those of you who are unused to the unique way in which Australians name objects and occupations, the term “Lollipop Man” does not mean that Drew works in a candy store — as if I’d let my kids anywhere near a lolly shop twice every weekday. 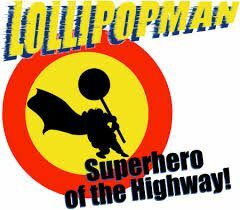 It means he is the Crossing Guard who stops the traffic at the pedestrian crossing near Marvel Girl’s school and Miss Malaprop’s preschool. He’s the guy who keeps us safe. Drew remembers all our names — and I mean all our names, including children, animals and sometimes even teddy bears — and he greets us every morning with a welcoming smile that makes you forget, momentarily, the massive struggle it was to simply get out the door (you know the one, where you yell random words like “teeth”, “shoes” or “schoolbag” to unresponsive children in various states of dishevelment while holding an increasingly cold cup of tea). Drew also notices details: he spots recently lost teeth, merit awards, band aids on injured knees, new shoes, haircuts, and all manner of minutiae at ten paces, and celebrates these little things with a high five or commiserates with a sympathetic word or two. Drew is remarkably adept at picking which child is hiding within which costume come Book Week every year, and he’s also very good at remembering kids’ birthdays — which may or may not have something to do with the fact that he gets reminded exactly how many sleeps it is until the birthday of the child in question every time they cross the road (and yes, I do mean every time). Drew is also brilliant at offering words of encouragement and praise — particularly to the preschoolers who visit his crossing each afternoon, proffering whatever artistic (and I use that word loosely) creations they have fashioned that day in his general direction. It doesn’t matter whether it is a stick covered in glitter, a page covered in random blobs of paint, or a couple of boxes and cardboard tubes taped together, Drew is always ready with an enthusiastic comment or an admiring remark…and those little people walk off that crossing feeling ten feet taller than when they stepped onto it. Thank you Drew! Goodbye and good luck! But now, alas, our days with Drew have drawn to a close: he and his lovely wife moving house, and today is his last day of being our very own Lollipop Man before they head south. Needless to say, Drew will be sadly missed. Drew, thank you for brightening our mornings and afternoons, for being one of those people who makes a this world a happier, more positive place to live. And thanks for the multitude of “lollies” you have pretended to dispense to the my kids and their little mates — you’re the Lollipop Man they will never forget. Move over McCoy — we’ve had the Real Pengilly. And if you have enjoyed this post and want more musings from the Daydream Believer delivered straight to your inbox whenever they appear, click the follow button at the top right of this page…go on, it’ll be fun!